How to Declutter Your Clothes | Downsize Your Wardrobe Today! We all have those things we’ve been holding onto for way too long. They’re shoved in the back of a drawer or closet somewhere, taking up space and collecting dust until that “someday” comes. But you know what? Life’s too short to keep waiting for someday! Your wardrobe shouldn’t be full of clothes that you hate or clothes that are just “meh”… It should be full of clothes that you LOVE! You shouldn’t spend hours debating what to wear because you have so many clothes to weed through and none of the options are appealing. 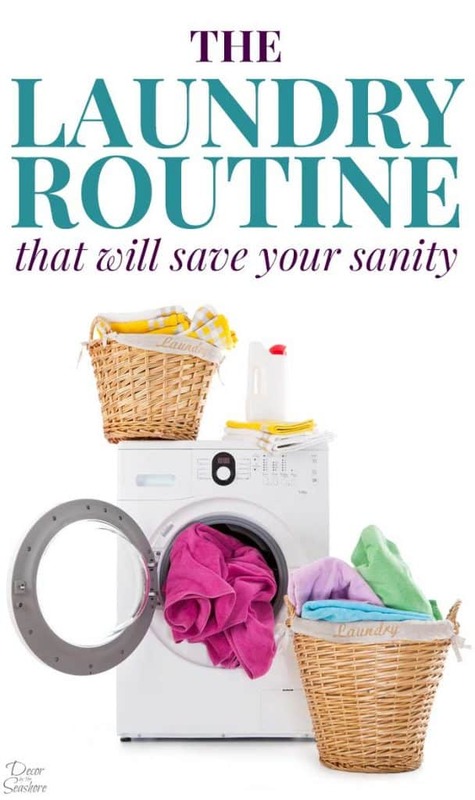 You shouldn’t waste time washing, drying, folding, and putting away clothes you don’t really like. All those clothes you’re keeping are just taking up valuable space and making you work for them. 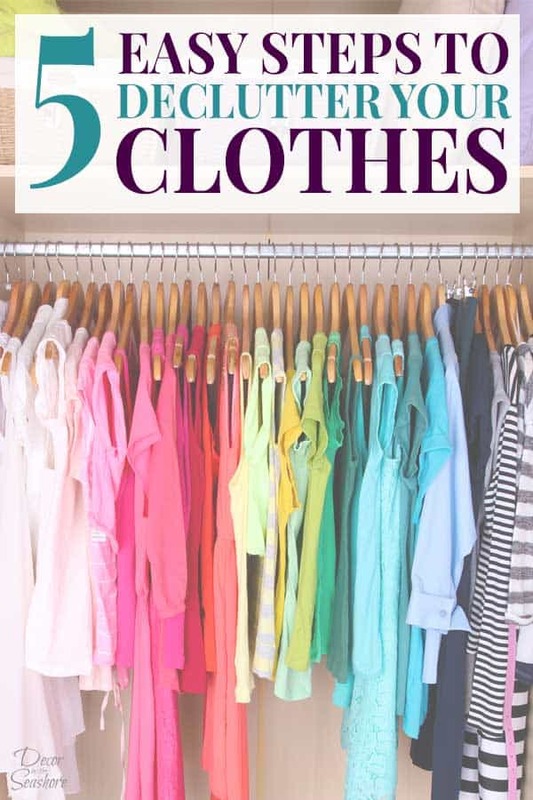 Decluttering your wardrobe is one of the best possible gifts you can ever give yourself! Because decluttering your clothes is about so much more than just freeing up space! When you declutter your wardrobe, you give yourself permission to be where you are in life right now. Not the person you were a year ago who was 20 lbs skinnier, or the person you think you will be 6 months from now who has a flatter belly… Just you, the way you are, right here and now. Why Should You Declutter Your Clothes? Getting rid of all the clothes you no longer need or wear is key to creating a stress-free home! It’s an incredible time saver. Think about it! The less clothes you own, the less time you have to spend trying to figure out what to wear. No more spending hours trying to find something that fits and looks nice. Because when you declutter your clothes, you get rid of all the things that don’t fit well and make you look great. You get rid of things that you can never find matching mates for. The things you keep are the outfits that you know will look great and fit nicely. No more trying to organize and fit all these clothes into your closet and drawers. Once you declutter your clothes and only keep what you actually need and use, you’ll find your dresser drawers are no longer overflowing with excess and you can actually see the things hanging in your closet! 1. Gather all of your clothes together into one spot. Pull them out of your closet, dresser, under the bed, and anywhere else you have them stashed. We want everything out in the open so we can give your wardrobe a thorough decluttering! Do you feel confident about wearing it? Do you wear it regularly? Is it too big, small, worn out, stretched out, stained, or full of holes? Is it too hard to find something to match it? Has it been months since you’ve touched it? Have some items you’re unsure about whether to keep or toss? Try them on in front of a mirror right now! Do you feel good about wearing them? Then they stay! If not, they need to go! Keep the clothes that you need right now, for this season of life you’re in. I guarantee your body will thank you, and every time you look in the mirror, you’ll thank yourself! 3. Put the clothes that you’re keeping back where they belong. You should have a lot more space now to organize the clothes that you’re actually keeping. Make sure to fold and hang everything neatly so the next time you pick out an outfit, you can easily see everything you have. 4. Sort the clothes you’re getting rid of into piles for selling, donating, and tossing/recycling. Websites like ThredUp are another great way to make some cash for used clothes. Just send them in and they take care of most of the work for you. eBay is another popular place to sell used clothes. Anything that’s in good condition that you can’t or don’t want to sell can be donated to a local charity like Goodwill or Salvation Army. Items that are too worn to donate can be tossed or recycled. Did you know Nike recycles old athletic shoes? And stores like H&M will accept old clothes for recycling. 5. Keep your wardrobe decluttered! Now that you’ve decluttered all your clothes, don’t undo all your hard work! Trust me, it’s so easy to fill your closet back up. Make a rule that for every new clothing item you bring home, you must get rid of one in its place. 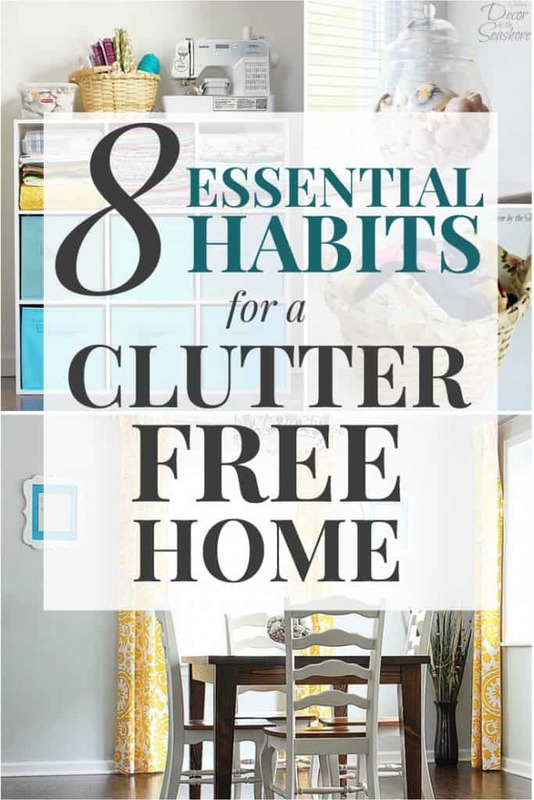 This is an essential habit for creating a clutter-free home! I highly recommend giving your wardrobe a thorough decluttering at least twice a year. That way you’ll have a chance to go through different seasons of clothes. I’m not gonna lie, decluttering your clothes isn’t always a fun process. But I will say that it is one of the best things you can do for yourself and your home. Running a home is stressful, but it doesn’t have to be that way! It’s my goal to take the stress out of your home life and give you more time to spend doing the things you love. 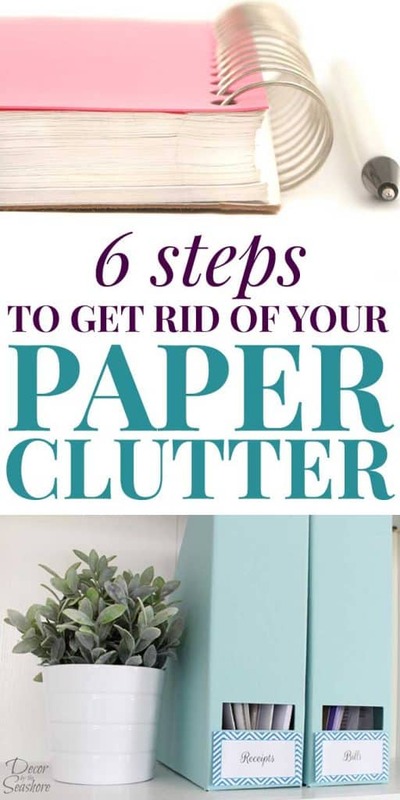 Decluttering your wardrobe is one of the ways you can begin to de-stress your home! If you enjoyed this post, be sure to pin it for later so you can easily refer back to it! And don’t forget to share it with friends and family on Facebook who could use the help decluttering their clothes, too! Thankyou I Keep reading your articles and knowing I need To DE clutter. It’s so hard.. I feel like I’ve put my life on hold. But I know all feel so so much better if I get it done. I feel very overwhelmed thinking about it. How could I distress about that? HELP!!! Help me get started so I have more time to LIVE. I need a book to refer to, I have had a couple of strokes and having a reference book would just be the ticket for me, do you sell your books?